uSound represents the next generation in digital hearing-aid technology: an audio streaming system that improves hearing quality. 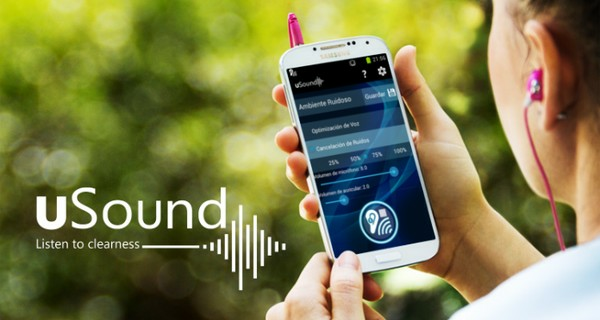 Instead of just amplifying audio, as traditional hearing aids do, uSound combines a range of functionalities so users get unprecedented control and choice in how they programme their optimal sound quality: adjusting audio frequencies according to their impediment, their environment, and other preferences. You can configure your settings according to the results of the app’s audiometric test, and log settings that suit specific environments so you can quickly click between your own bespoke audio settings while you’re on the go. Each ear can be programmed independently. There’s a broadcasting function that lets you listen to talks, discussions or lectures, relayed in real time from your smartphone to a Bluetooth headset (ordinarily with a range of 15 metres) in the exact mode that suits your hearing. And a clinical function lets you manage your appointments with clinicians. The device allows you to fine-tune how you hear these levels, gradually adapting and filtering noises to levels and tones that suit you, helping you filter speech from background noise for example. The app was the idea of the Argentine Engineering in Computer Science delegation of the Catholic University of Santiago del Estero to the 2013 Microsoft Imagine Cup. Founders are Ezekiel Escobar, Alejandro Mendez, Enzo Cano, Rafael Manuel Rodríguez and Victor Tolaba Aizama.